A good way to increase your cooking repertoire, support your local butcher and save money is to try some old fashioned meat dishes. The popular meals of twentieth century Britain often used meat cuts or parts of the animals that are not so popular nowadays, but with the rise in awareness of where our food comes from and resurgence in British cooking in the fashionable restaurants now is the perfect time to try out a few new ideas. To make a classic steak and kidney pie, start with your pastry. You can cheat and buy pastry from the supermarket, but making your own can be rather therapeutic and you will know exactly what has gone into it. Make a short crust pastry and let it rest in the fridge while you make the filling. You will need a mixture of good quality steak and kidney - the ratio of steak to kidney will depend on preference and budget! Coat your meat and offal in well seasoned flour and fry with a chopped onion in some butter. After a few minutes, add a rich beef stock (a cube is fine). Line your pie dish with the pastry, add the filling, top with pastry and make a little hole for steam to escape. Once baked, this is perfect with carrots and peas on a chilly winters evening. A good hot pot is the perfect one pot supper - only one dish to wash up and no lost vegetable nutrients because it is all cooked together. There are a number of variations on this, with a few British towns claiming their own version is the original and best. The Lancashire Hot Pot is a well-known version. 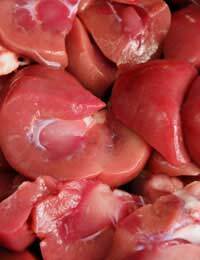 To make it, fry off seasoned cubes of neck of lamb in a casserole dish, add carrots, onions and a good meat stock. Cook for a while and then layer thinly sliced potatoes over the top. This is all then baked in the oven. The meat stays meltingly tender, with the top layer of potatoes lovely and crispy around the edges. Faggots used to be a mainstay at the British dinner table but fell out of fashion in the late 1900's. The amusing name and ingredients did not help their cause, although the fashion for such dishes is being increased thanks to offal lover's restaurants such as St Johns in Smithfield and chefs including Hugh Fernley-Whittingstall and Fergus Henderson.Some butchers are now starting to make their own again, which make a very cheap, nutritious and tasty dinner, perhaps with mash potato and onion gravy. To make your own, you will need to pay a visit to your butcher because you are unlikely to be able to find the ingredients you need at the supermarket. You will need lambs heart, liver and some meat - perhaps belly pork. All this is to be chopped and mixed with seasoning and breadcrumbs. Make egg sized balls and fry them in a little oil or butter. As you can see from the ingredients, faggots are a very economical dish - perhaps it is time to rename them so more people will try them!